Nobody has ever said they can’t wait to go home to look at the school website – Why parents prefer School Rush school app? And yet, school districts spend 1000s of $s on Websites! The above tweet by instructional technologist, Michelle Russell, inspired this post. Over the past decade and a half, districts have spent considerable resources building and maintaining websites. In the early 2000s there was a big push to create websites for school districts. At the time, even federal funds were available for districts to fund these website projects. School districts published district news, calendars, staff profiles, budgets, board meeting minutes, policies and documents on their websites. Teachers and Superintendents were asked to create teacher pages and write blogs. Prospective parents, community members could research and access all of this information online and on demand. Fast forward to 2017, districts have adopted email, texting, social media & school Apps. But these efforts have not resulted in higher parent engagement. Educators are learning that broadcasting information is not enough! Less than 5% of parents visit district websites. More than half the parents don’t even open emails from the districts. Web, email, social, sms communication channels come with their own challenges when used for parent communication. Web is inherently a pull technology solution, i.e. parents have to go to your website to receive information. And aptly stated by Michelle “Nobody has ever said they can’t wait to go home to look at the district website.” Email fatigue has set in, who is not overwhelmed with emails? Social media cannot be relied on for critical communications. Parents balk when texting is used too often. There is cost on the receiver side when texting is used. FB & Twitter are constantly tweaking their algorithms to promote ads and increase their revenues. to which they have become accustomed. Simply putting your district website content in a custom App does not increase parent engagement. And classroom communication Apps that don’t integrate with district systems are not the solution. School Rush! school communications app enables personalized communication and instant access to school, classroom events, news, activities and emergency announcements! Personalized being the key word. School Rush! school mobile App consistently beats all other school outreach forms COMBINED! Why do parents prefer SchoolRush school app? Info about just their kids in a newsfeed format. photos & notes on everything their children are learning. 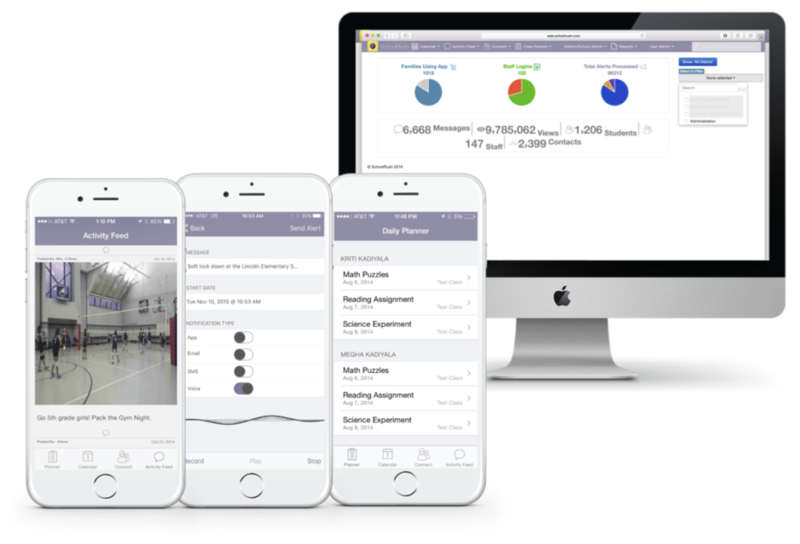 Request a demo to learn why schools prefer School Rush and how we can improve parent engagement at your district.